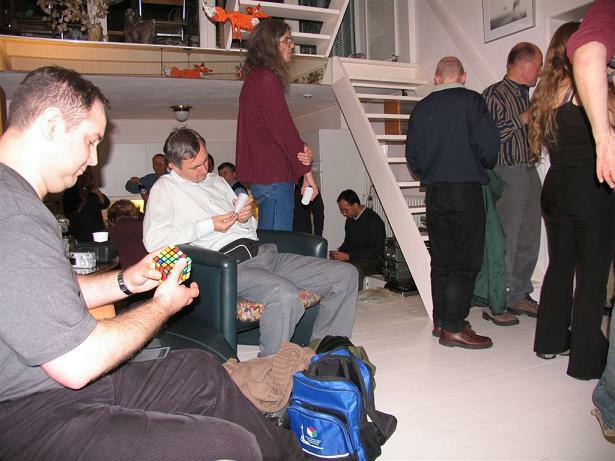 The 24th Dutch Cube Day was held in Groningen, The Netherlands on Sunday October 10, 2004. The venue was the Noorderpoortcollege. 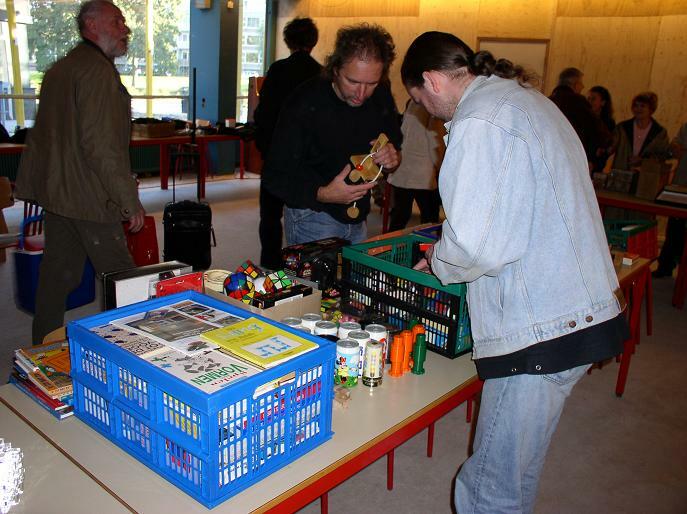 Dutch Cube Day attracted more than 100 people from quite a number of countries, among others The Netherlands, Germany, Russia, Czech Republic, United Kingdom, Belgium and Luxemburg. 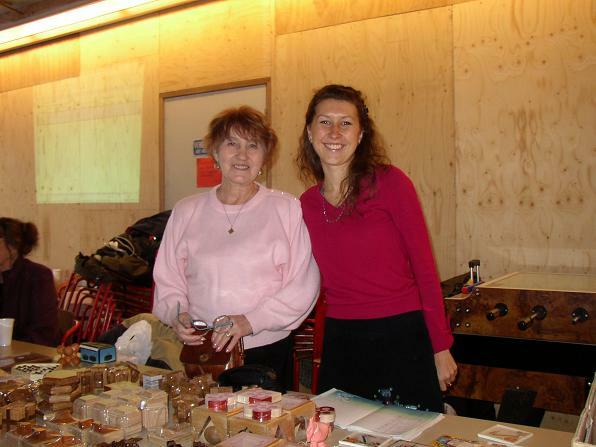 Main organizer of the cube day was Willeke Christiaans, from the Wirwar puzzle shop in Groningen. Thank you again Willeke! Because Groningen is in the far northeast part of The Netherlands we decided to drive to Groningen the day before the cube day. This also gave us the opportunity to do some preliminary rounds of the Dutch Open 2004 championship on saturday night. After checking in at the hotel, we walked to the Wirwar puzzle shop. The hotel didn't have a nice lobby, so we were very happy when Willeke told us that we could have the first day of the competition in her house. 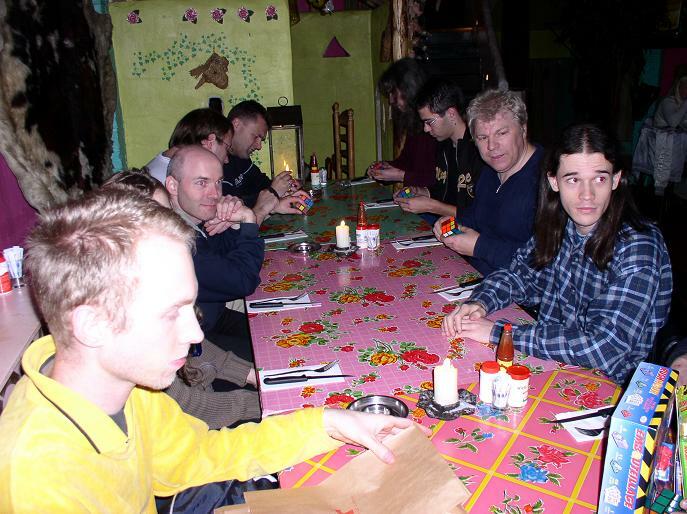 We had dinner in a Mexican restaurant, with Koen Heltzel, Ton Dennenbroek, Jaap Scherphuis, Peter Jansen, Stefan Pochmann and his friend Maria Rivilis, Hans van der Zijden, Lars Vandenbergh, Jorge Best and his wife (who had both come over from Texas, USA! ), Joël van Noort, Mike Godfrey, Sean Connolly, Milan Vodicka, Arjan Bosse and Ron van Bruchem. Although the food was pretty good, the main interest was puzzles. After dinner we walked to Willeke's house where we also met some puzzle collectors from The Netherlands, Germany and Luxemburg. In total we had 25 people joining the party. 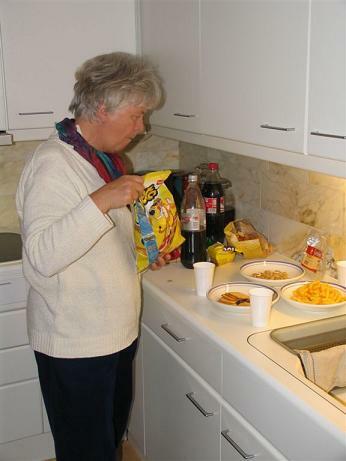 Willeke Christiaans taking care of her guests. 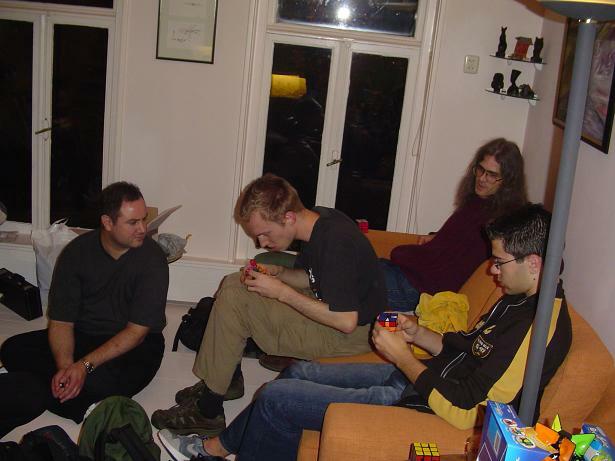 Around 8pm we started the preliminary rounds of some competitions of Dutch Open 2004. Jaap had created special scramble programs for all puzzles. 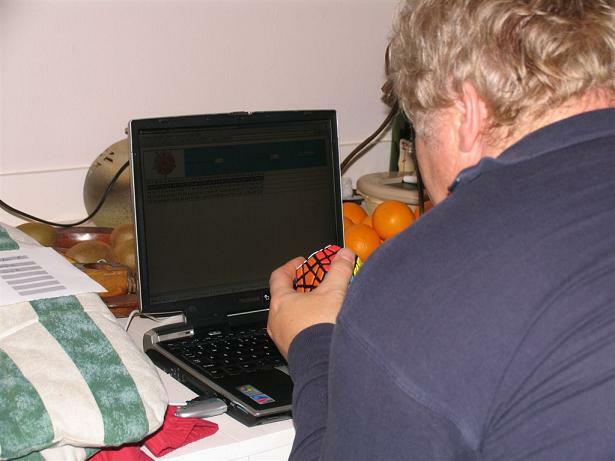 Ton scrambling a Megaminx using Jaap's program. 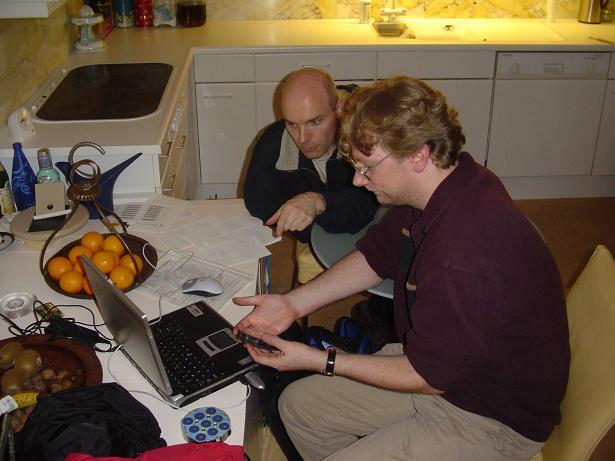 Jaap explaining to Arjan how to scramble a Clock. On the front from left to right: Sean, Milan, Mike, Arjan, Willeke's husband and Maria. From left to right: Sean, Stefan, Mike and Joël. The preliminary round of Square-1 was a great competition between Lars and Mike, with Mike breaking Lars's world record set in Toronto. We ended the preliminary rounds around 11:15pm. Great performances were set by Stefan Pochmann (world record at Rubik's Clock and European record at Megaminx), Joël van Noort (national record at 3x3x3 one-handed), Lars Vandenbergh (approaching his 5x5x5 world record). 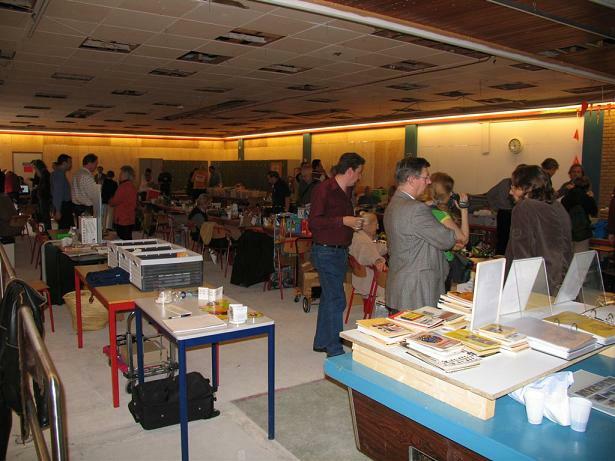 The cube market opened around 10am with offers on about 30 tables. 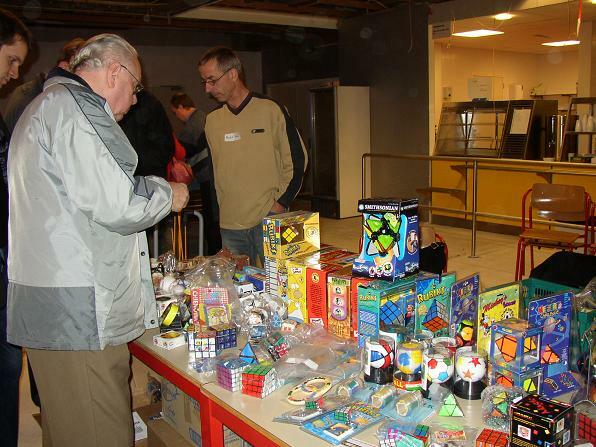 Overview of the Dutch Cube Day puzzle market. Wil Strijbos from The Netherlands. Hendrik Haak from puzzle-shop.de, Germany. Milan Vodicka from Czech Republic. The Lohe brothers from Germany. Two lovely ladies from Russia, with beautifully crafted Russian puzzles. 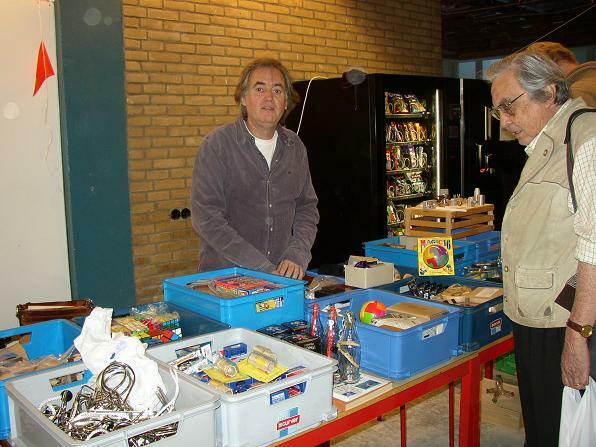 Peter Jansen looking for puzzles in Joop van der Vaart's boxes. Edo Timmermans: "Shape Shifting Trinities"
Oskar van Deventer: "Oskar's Exotics"
Dutch Open 2004 was organized by Ron van Bruchem, who had help from a large number of volunteers for judging and scrambling. Special thanks go to Jaap (for scrambling on saturday and for making the scramble programs), Peter (for scrambling on sunday), Daan Sleurie (for judging on sunday) and Stefan Bayens (for judging on sunday), but all competitors contributed their share. In the first round Lars set a great 14.60 seconds to take first place. Ron was second and Joël third with all three times in low 20's. Ton showed that he improved very much recently setting a personal best of 22.66 seconds. In the semi final Ron was beating his nerves a bit setting a good average of 17.12 (including a 2 second penalty for misaligning the last layer). Lars was second, and set a very good 13.94 seconds in his last attempt. Joël and Koen were third and fourth to the final. Guus Razoux-Schultz, WC 1982 runner up, just missed the final, but he promised to start practicing a bit more to perform better next time. Ton again improved his personal best with his first time under 20 seconds: 19.87 seconds. In the final Lars recovered and took the Dutch Open 2004 title with an average of 17.67 seconds. Ron was too eager and made several bad mistakes, but he was still fast enough for second place and the Dutch national title. Joël broke his personal average record with a new record of 21.39 seconds, finishing third. Top 3 of 3x3x3 competition: in the middle winner Lars, on the left #2 Ron, on the right #3 Joël. Lars and Ron had a close competition in the first round. But Stefan was a big threat, because he improved a lot since Euro 2004. Ron took the lead in the final, but then had a lot of bad luck. In his 2nd attempt he had a pop, and he decided not to continue. Unfortunately in his 3rd attempt he had three bad pops and at the end he had to disassemble an incorrectly oriented corner. He lost his concentration, which also influenced his third attempt. Lars on the other end improved with his second and third, claiming his second title of the competition. Lesson: always prepare your cubes perfectly! 4x4x4 competition with Arjan, Guus and Stefan. Lars was well ahead of the others with all his 5 attempts faster than all other competitors. He set a fantastic new average world record of 2 minutes 24.99 seconds. Ron was second with national records for single cube and average. Stefan Pochmann is the European champion and unbeatable on this puzzle. He had already set a world record (video) in the first round and went for safety in the final. 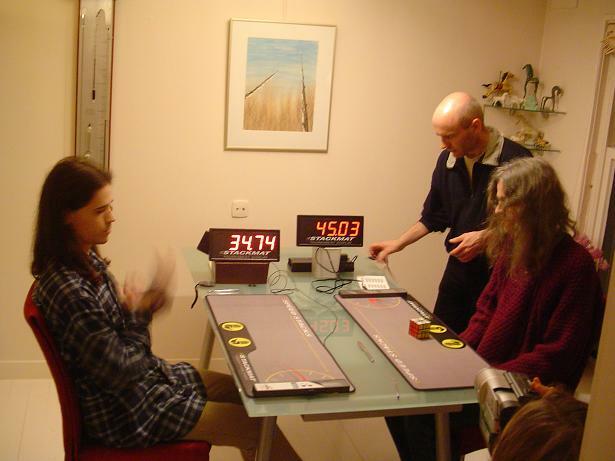 The other finalists, Lars and Koen, both stopped the timer when the back side of their Clocks wasn't solved. Koen was the surprising winner in this competition beating both world champion Jaap and world record holder Stefan. Koen was the most consistent, where Jaap and Stefan both had some bad attempts. Koen has a slightly different technique finishing the Magic upside down. Stefan set an amazing world record in the final, with a time of 1.36 seconds (video)! 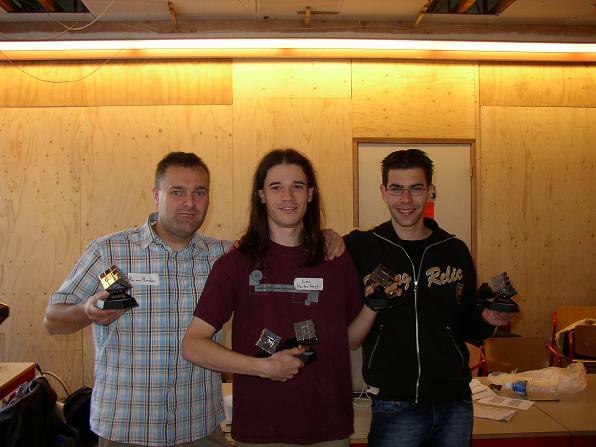 Ron giving the Rubik's Magic trophy to winner Koen. Lars and Mike had a great fight, but Lars was slightly faster and more consistent. Lars also regained his world record: 25.29 seconds (video). There were 5 competitors of which 3 succeeded in solving the cube blindfolded, with so many people watching them. 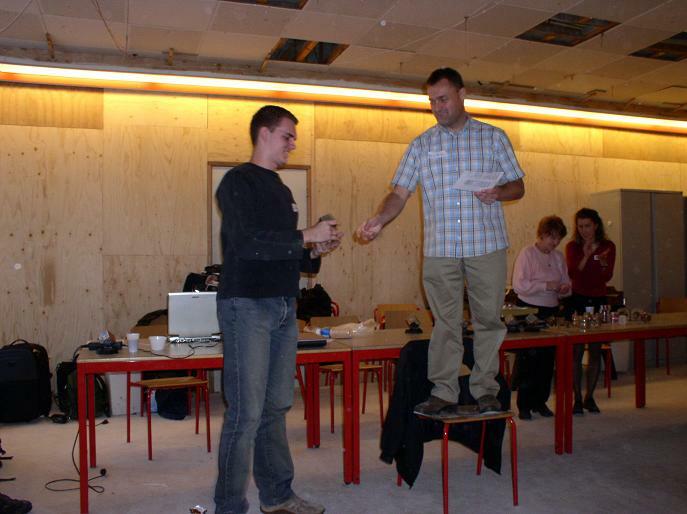 Both Joël and Lars solved blindfolded for the first time in a competition, setting national records for their countries. Stefan, who is still the only person having solved a Rubik's 5x5x5 cube blindfolded in a competition, beat his German record with a time of 9 minutes 8.50 seconds. 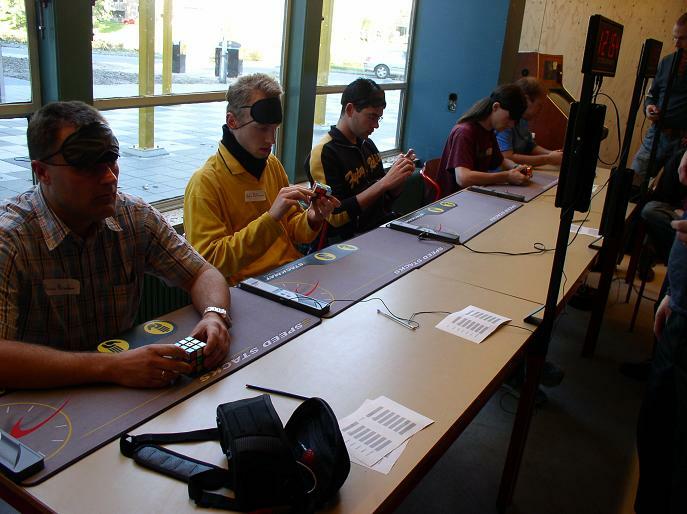 Blindfolded competition with Ron, Stefan, Joël, Lars and Hans van der Zijden. Dutch Cube Day 2004 and Dutch Open Championship 2004 were a big success. Many world, European, national and personal records were broken. It was great meeting friends, many puzzles exchanged owners, and all speedcubers took some good competition experience back home. 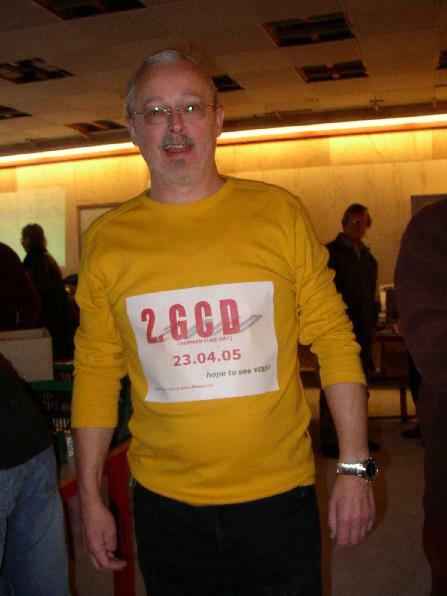 We hope to meet you all again on April 23, 2005 in Gütersloh, Germany for the German Cube Day 2005 and the German Open 2005. 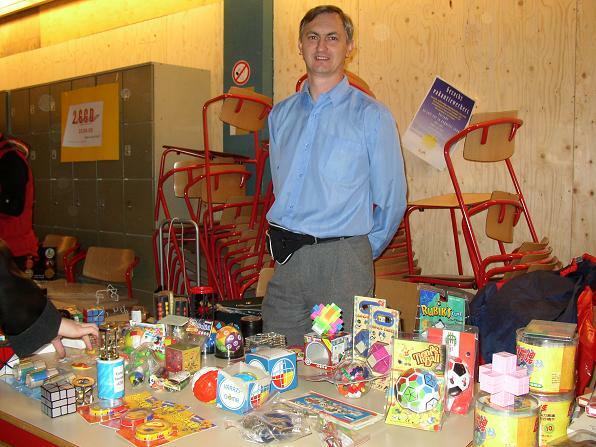 Martin Brockmann promoting his German Cube Day 2005. Thanks to Hans and Koen for letting me use some of their pictures.